Skype for Business brings together the familiar experience of Skype that people have come to know and love with the trusted platform of Lync. Delivering technology that helps people connect—to discuss, share and collaborate—is core to Microsoft’s mission to reinvent productivity, and Skype for Business is central to those efforts. 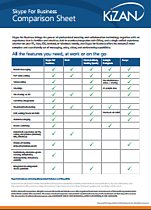 This comparison sheet will provide you a visual representation of all the features Skype has to offer compared to other UC platforms. The goal is simple: to create the most loved and trusted communications platform for doing things together. Meet with up to 250 people—even if they're not on Skype for Business. All they need is a phone or internet connection. See your contacts' online statuses, schedule meetings in Outlook, and start conversations from apps like Word and PowerPoint.